Paul Bildt interrupted his education as a police officer to take acting lessons with Friedrich Moest. In 1905 he debuted in Hannover at the summer tour of the German director Linsemann. From 1905 to 1913 he was engaged at the Schillertheater in Berlin and in 1910 he was in his first movie. In 1908 hem married the Jewish actress Charlotte Friedländer. They had a daughter, Eva. During the First World War he served for a while in the army but this was ended by an illness. During the 1920s he was one of the most popular actors and he also made himself a name as a director. When the nazis came to power he was in danger because of his Jewish wife but he was protected by Gustaf Gründgens and continued working at the Preußischen Staatstheater. He was forced to play in several propaganda movies. In 1945 his wife died of cancer. When the war ended he was at Gründgens' house in Zeesen with his daughter. When the Russians approached he and Eva took an overdose of veronal on 26 Apr 1945. Eva died but Paul survived after several days in a coma. After his recovery Gründgens employed him in Düsseldorf and from 1954 until his death in 1957 he worked for the Kammerspiele in Munich. His second wife was Katharina Pape who died in 1972 is buried next to him at the Landeseigener Friedhof Dahlem in Berlin. Charlotte Friedländer was buried in Zeesen. 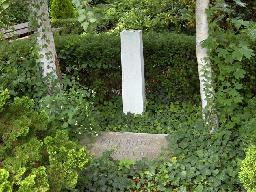 The grave of Paul Bildt at the Landeseigener Friedhof Dahlem, Berlin.